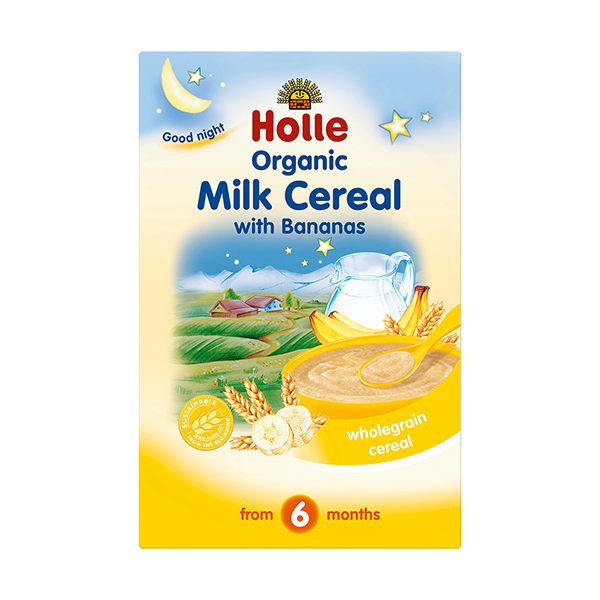 Holle organic milk cereal with bananas has a mild fruity flavour that babies just love. Satisfyingly filling but still easy to digest as the starch is already broken down. Ideal as a nighttime porridge and to get babies used to a spoon and a new diet. 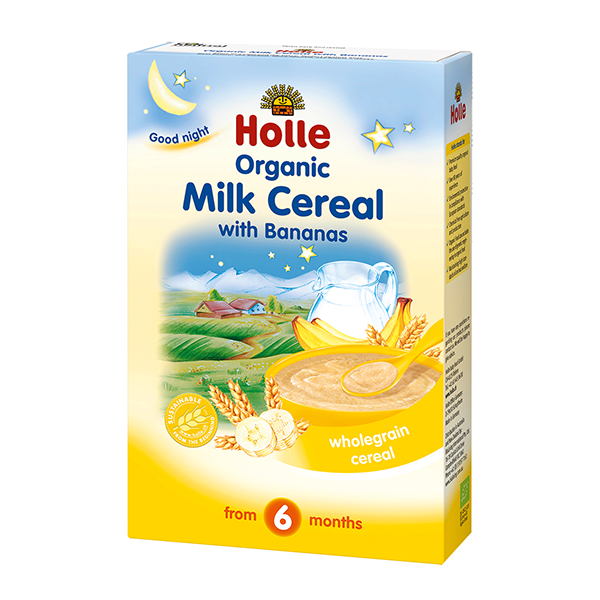 Holle Organic Milk Cereal With Bananas is made from 99% premium organic ingredients. It is unsweetened and quickly made up. Preparation: Boil 130ml water and cool to approximately 50 degrees centrigrade. Pour into a dish and stir in 4 to 5 tablespoons of Organic Milk Cereal With Bananas (40g). Stir and allow to cool to approximately 37℃. Ready! Contains gluten. Always feed the porridge to your baby with a spoon. Do not give to babies under 6 months as a substitute for breast milk. Always prepare fresh food for each feed. Do not use leftovers. Due to the risk of overheating do not heat in a microwave. Store in a cool, dry place. Once opened use within 2-3 weeks. Wholegrain WHEAT flour** (34%), WHEY powder* (partly demineralised)(21%), skimmed MILK powder*(16.2%), palm oil*, dehydrated banana pulp*(8.5%), maltodextrin*, calcium carbonate, vitamin A, vitamin B1, vitamin D.
Vitamins and minerals are added in accordance with EC provisions on infant cereals. 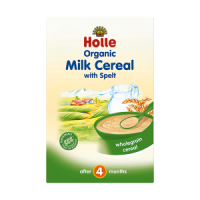 Got a wee sample of this cereal with my order and my little one loved it, tastes delicious and i will definitely be purchasing it with my next order!! My Baby loved it and finished whole bowl. It’s fulfilling with an exciting flavour for babies. My little boy favourite poriage. Especially he enjoys it before going to the bed. I have twin babies and my days are quite intensive, by the end of the day I feel exhausted. 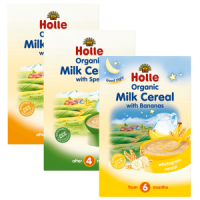 Ulula sent me a few samples of Holle Organic Good Night Banana porrige and when I tried them, it was one of the best discoveries. Easy to prepare and my babies love it! I don’t need to add anything else, just water. I have ordered more and definitely recommend it to other mums! Daughter seems to enjoy this milk cereal, I tasted it myself and it has nice gentle taste. Will be buying again. 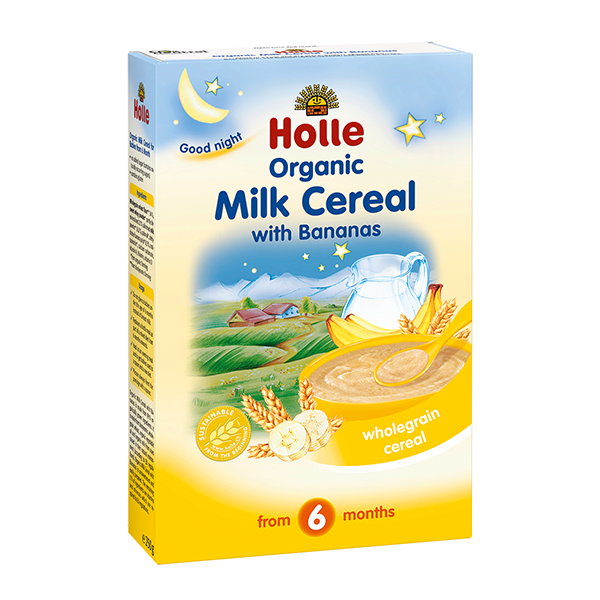 We love this cereal, I actually give it to my baby in the bottle, it is very easy to mix and you can make it any consistency you like. She has it before bed time and it settles her to sleep for longer then just a milk. my baby loved her sample of this so will be buying in the future! loving all the Holle range!